As much as Denver has changed throughout its history, much of the city remains the same. On any given night, thousands of residents walk the streets with nowhere to go. They take to alleyways, hide under bridges, or camp along busy roadways hoping to rest long enough before a police officer asks them to move along. This story is a part of every urban center in America. But, it wasn’t written in stone. Denver has been very forward-thinking in its approach to solving problems afflicting its homeless individuals by enacting state-run programs such as Denver Day Works that help to educate and train individuals on financial skills and workplace readiness. The city has also created private investments opportunities like Social Impact Bonds to make up for funding shortfalls. Still, the homeless population continues to rise. What gives? Tafoya’s point is a salient one. However, Denver’s homeless problem is not unique, and is in fact similar to other tier-1 real estate markets such as San Francisco or New York City. One similarity is that Denver relies on the tech industry for much of its economic growth. According to a report by CBRE, a real estate research firm, 22 tech companies opened up or moved to Denver in 2017, accounting for nearly one million square feet of office space. This increased demand has caused business development to outpace housing development by nearly ten-fold, according to estimates by The Denver Post. The newspaper also found that the city registered over 117,000 new businesses in 2017, including having 15 major businesses either relocate or open an office in the city, compared to building just over 15,000 housing units. Increased demand for business space requires municipalities to reconfigure their zoning codes to accommodate the influx of employees as well. Oftentimes, mixed-use development is utilized, which stacks new residents in apartments above shopping centers. This kind of development is great for the young, white and well-educated demographic that Denver’s job market is attracting, but distressing for growing families who have lived here for generations. The new Denverites add stress to Denver’s already tight housing market by creating demand for housing in otherwise low-demand areas. Historic neighborhoods such as Elyria and Swansea are seeing increased interest by real estate developers who then build modern units for their clients. This raises the property values in the neighborhood, oftentimes to the detriment of those who can’t afford to purchase a home or pay their higher share of taxes. 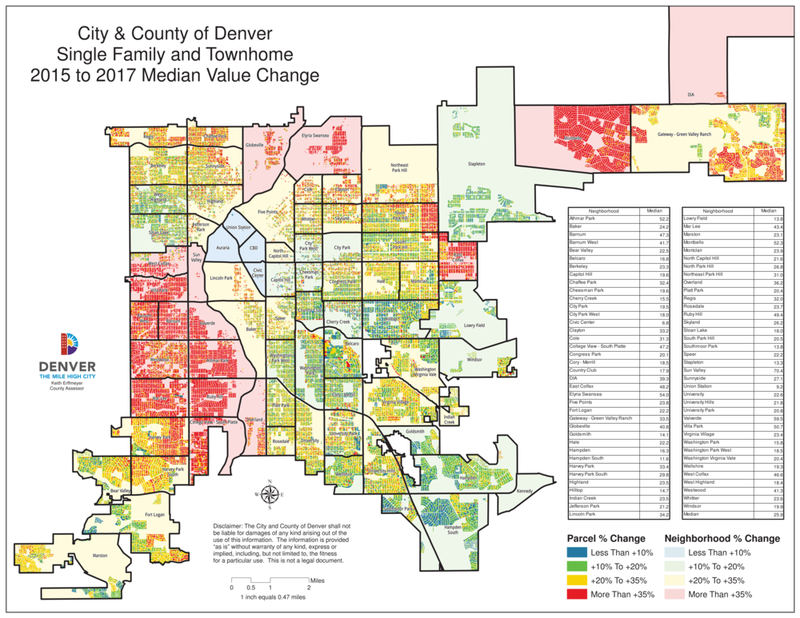 A study on Denver’s low-to-middle income (LMI) housing by The Urban Institute found that “rental cost burdens, households paying 30 percent or more of their income on housing costs, increased from 2000 to 2015 for very low–income (VLI) and LMI families (60 to 82 percent among VLI households and 7 to 26 percent among LMI households). Oftentimes, these families live in cities that are highly populated with cultural minority groups such as Belcaro. Thankfully, the number of homeless families has steadily declined, according the 2018 Point-in-Time count. However, the same count found that the city’s homeless population has steadily risen to over 5,300 individuals, nearly four-times the population in 2014. Denver’s newly homeless (those homeless for less than one year and are first-time homeless) and transition-aged youth (18-24) have both increased as well. A quick glance at Denver’s Zoning Map shows that most of the mixed-use developments are cropping up along the city’s main arterial roads such as Colfax and Broadway. Both roads are known for their retail, food, and entertainment while also seeing increasing numbers of homeless individuals. But, the increases have been met with disapproval from the city. A study conducted by the Homeless Advocacy Policy Project at Denver University’s Sturm College of Law found that Denver, Boulder, and Colorado Springs have collectively passed 37 ordinances outlawing behaviors typical of people experiencing homelessness in 2017. The behaviors include camping, lying down, or living near water. In late October, Denver Public Works, the police department, and volunteers cleaned up a homeless camp on Broadway that was home to nearly 100 individuals near the Samaritan House. The reason they gave for the sweep was one of public safety; that there was too much trash. That’s why Denver created programs like Denver Day Works, which helped 110 individuals find permanent work in 2017, according to government records. However, that means they helped about two percent of the state’s homeless population at-large, or 10 percent of the chronically homeless. Social Impact Bonds were created as a way to spur private investment in the homeless problem. So how should Denver be fighting its homeless issues? Who should take the reins? As this series has examined, gentrification in Denver began as a way of disenfranchising communities of color by restricting their access to permanent housing. Doing so kept those communities from establishing a political or economic presence in the Mile High City. Some of the same tactics used to disenfranchise communities of color are present today—from banks offering subprime loans at higher rates to people of color to legally limiting the definition of communal art space in impoverished communities. But, the answer can’t be as simple as political galvanization. If it were that easy, the problem would already be solved. What’s needed is diligent civic engagement from the general pubic, not just in communities of color. “When I meet people that are new to Denver, I ask them to do four things: register to vote, register their vehicle in the state, use local libraries and recreation centers — to feed their bodies and minds — and to volunteer,” Tafoya said. Coloradoans cast over 2.2 million votes during the 2018 midterms, according to data from the Secretary of State’s office. This was the highest turnout for a midterm election in the state since 2002. Colorado also had the second highest voter turnout in the nation. “What we saw [in the midterm election results] was the people of Denver and Colorado sending a clear message about the type of future they want to see here in our city and state. In Denver, the people said yes to investing in more parks and open space and yes to helping the homeless and those who need our help the most,” Mayor Michael Hancock said in a press release after the midterm elections.